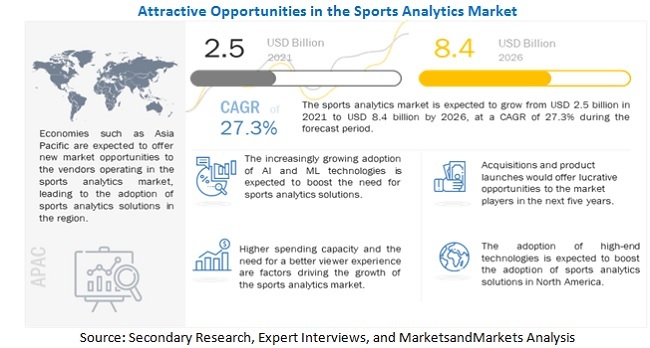 [124 Pages Report] The Sports Analytics market is expected to grow from USD 123.7 Million in 2016 to USD 616.7 Million by 2021, at a Compound Annual Growth Rate (CAGR) of 37.9%. The increasing volume of on-field and off-field data generated among various sports organizations has led to an increase in managing these data to analyze them. This need is driving the adoption of sports analytics solutions. Analytics and big data technologies have found huge potential in various industries, including sports. The increasing demand of coaches, mentors, and other management officials for real-time access to the insights of relevant information presents huge potential for sports analytics market. The demand for cloud-based sports analytics solutions is also expected to increase due to the lack of budget allocation for hiring technical skills and experts to analyze data for sports organization. These are some of the major factors expected to augment the growth of the market. Moreover, in order to remain competitive, organizations are adopting sports analytics solutions. The overall market has been segmented by type, deployment type, application, and region. The study has been conducted on a global level, covering five regions namely, North America, Europe, Asia-Pacific (APAC), Middle East and Africa (MEA), and Latin America. The overall market is expected to grow from USD 123.7 Million in 2016 to USD 616.7 Million by 2021, at a Compound Annual Growth Rate (CAGR) of 37.9%. The research methodology used to estimate and forecast the sports analytics market begins with capturing data on key vendor revenues through secondary research. The vendor offerings are also taken into consideration to determine the market segmentation. The bottom-up procedure was employed to arrive at the overall market size of the market from the revenues of the key players in the market. After arriving at the overall market size, the total market was split into several segments and sub-segments which are then verified through primary research by conducting extensive interviews with key people, such as CEOs, VPs, directors, and executives. This data triangulation and market breakdown procedures were employed to complete the overall market engineering process and arrive at the exact statistics for all segments and sub-segments. The sports analytics ecosystem consists of vendors and end users. The vendors provide solution and services to the end users for different application areas. The vendors consist of some major players such as IBM, SAP, SAS, Tableau Software, Oracle, STATS LLC, Prozone, Sportingmindz, TruMedia Networks and Opta. However end users include all the sports organizations that includes domestic and international franchisees, clubs, associations, and sports academies. The Sports Analytics market is expected to grow from USD 123.7 Million in 2016 to USD 616.7 Million by 2021, at a Compound Annual Growth Rate (CAGR) of 37.9%. Sports analytics helps various sports organizations management to analyze data from multiple sources and estimate future probabilities to improve decision making for game and business processes. Predictive analytics model is the core of sports analytics which helps to analyze the big data in sports. Such data are related to teams, players, game strategies, fitness and health, social media, public forums, and fans. Thus, sports analytics is can help understand the probability of risk and opportunities in the sports industry. The term predictive analytics came into existence in the late 1970s. In 1960s, corporations and research institutions had started using non-linear programming which led to the commercialization of prescriptive and descriptive analytics. Until recently, analytics were used only in industries such as BFSI, travel, and logistics for analyzing risk related to their businesses and historical and real-time streaming business data so as to predict future insights and improve their decision making. Since 2010, with the advancement of cloud and other technologies, the adoption of analytics is rising in the sports industry. Furthermore, the rising need of various sports organizations to draw insights from the ever increasing volume of on-field and off-field data and the rising need for obtaining real-time insights delivered on smartphones and mobile devices are some of the reasons for high adoption of Sports Analytics solutions. However, there is a lack of awareness regarding the usage of analytics and technology in sports organizations and teams in various countries across the regions of MEA and APAC. Moreover, there are restraining factors such as budget constraints and high cost require to hire technical person with analytical abilities and expertise to analyze the sports data that are hindering the growth of the sports analytics market. Player and team performance analysis solutions are estimated to exhibit the highest adoption rate. Moreover, the increasing adoption of cloud-based solutions and demand for analytics for complex structured data streaming, will present new avenues for the growth in the future. Various sports analytics applications such as player analysis, team performance analysis, health assessment, video analysis, data interpretation and analytics, fan engagement, and other applications include hospitality management and sales & marketing management. Some of the major players offering solutions with these features include IBM, SAP, SAS, Tableau Software, STATS LLC, Prozone, Opta, and TruMedia. 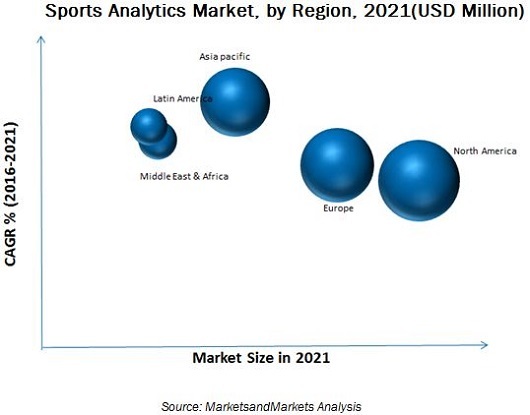 The Sports Analytics market has been segmented on the basis of regions into North America, Asia-Pacific (APAC), Europe, Latin America, and Middle East and Africa (MEA). North America, followed by Europe and APAC, is estimated to hold the largest market share of the overall Sports Analytics market in 2016 and would grow at a CAGR of 38.4% from 2016 to 2021. North America is rapidly deploying the Sports Analytics solution due to the dynamic market environment and higher technological adoption. Latin America and MEA regions are witnessing a slow growth in the adoption of Sports Analytics solution due to low technological implementations and less inclination of Middle East countries towards sports. The companies such as IBM, SAP, SAS, Tableau Software, STATS LLC, Oracle, and others have adopted various growth strategies to increase their share in the market. Partnerships and collaborations was the major strategy as that accounted for a share of 64% of the total strategic developments in the Sports Analytics market. Furthermore, companies such as Sportingmindz, Opta and Prozone launched new products and services to enhance their product offerings and expand their market. This strategy accounted for 15% of the total strategic developments. The strategy of mergers and acquisitions accounted for 21% share of the total strategic developments. 12.10 Sportingmindz Technology Pvt. Ltd.